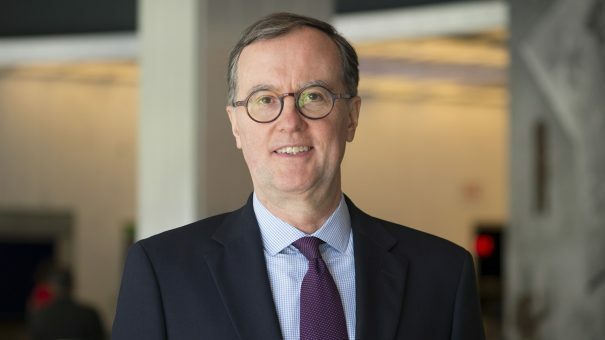 Ahead of the 2019 eyeforpharma Barcelona conference, we asked speaker Pol Vandenbroucke – chief medical officer of the Hospital Business Unit at Pfizer – for his views on how data and patient centricity are changing the industry. I am the chief medical officer of Pfizer’s Hospital Business Unit. The Hospital BU is a global Business Unit comprised of Pfizer’s branded hospital products, its sterile injectable portfolio and its anti-infective portfolio, spanning many different therapeutic areas and products. As the CMO for the BU I am responsible for a global medical in-country organisation as well as a headquarter staff that supports the different product groups. What are you proudest of in your career to date? I am very proud of my role in the design of the development strategy for atorvastatin. The Morbidity & Mortality program we designed took what was the fourth statin on the market to a leadership position by effectively integrating scientific and medical insights in the development program. As the medical community at the time was starting to ask the question if reaching lower cholesterol levels would be beneficial we designed a clinical program to answer that question taking advantage of atorvastatin’s particular characteristics. The resulting data were instrumental in providing evidence for reducing the risk of cardiovascular events for a wide range of patients. What are likely to be the biggest trends and changes that will affect your work in 2019? Without doubt patient centricity is the most important factor changing the way we work. Whereas previously we inferred patients’ input through our engagement with the medical community, patient engagement is now essential not only in order to develop new drugs but also to provide insights for medicines that are already approved and on the market. For some therapeutic areas this is more straightforward than others: for rare diseases for instance there tend to be well-established patient organisations who have a good knowledge of the development process; for other diseases that is much more difficult and it can be problematic to find input that is representative of the general patient population that has the disease. Patients’ view of pharma has changed as well, as patients are demanding to be heard, and in my view that is a very good thing. What kinds of engagements with patients and the medical community do you think will be most important in the near future? Engagement with patients and the medical community is evolving more and more in the direction of true partnership. For patients, it is important not only to have access to transformative new medicines and vaccines to effectively treat and/or prevent disease, but also for information and education, so they can have more empowered conversations with their healthcare providers and play a more active role in the decisions affecting their health. Conversely, we as an industry need to actively listen to the voice of the patient and put their needs and outcomes at the center of how we discover, develop and deliver new medicines, and engaging patients and patient organisations to that end will become more and more important throughout the entire product development process. Patients should be able to help shape not only study protocols but the whole approach to the development of a particular medicine or healthcare solution. For the medical community, the interaction is taking the form of real partnership in the dialogue between pharma companies and healthcare providers. In practice this means a much more externally engaged medical function and an expansion of medical to medical interaction which informs both practitioner and company. What role does data play in the future of your business? We have always been in the data business as developing medicines is in essence developing data around a molecule, be it on efficacy, safety, drug interactions, etc. The difference for the future is the way artificial intelligence will revolutionise the way we look for possible solutions for diseases and how we produce and analyse the evidence supporting them. This is both an opportunity and a threat for the pharmaceutical industry, as on the one hand it will enable a much faster and efficient discovery and development effort but, on the other, companies like Google and others are much more advanced than we are in terms of gathering and analysing large data sets. How does Pfizer see its role in the industry going forward? Looking to the future, Pfizer remains focused on delivering on our purpose; to innovate to bring therapies to patients that significantly improve their lives. Our belief is that all people deserve to live healthy lives and this drives our desire to provide access to medicines that are safe, effective, and affordable. We make it our priority to discover, develop, and deliver first-in-class medicines, vaccines and over-the-counter products that will provide value to people across the full spectrum of their health needs – from prevention to treatment to wellness – and help them live longer and healthier lives. Pol Vandenbroucke will be speaking at the 2019 eyeforpharma conference in Barcelona in March. Vandenbroucke‘s career has spanned the US, Europe, Asia, and Latin America. Prior to his current role as chief medical officer of Pfizer’s Hospital Business Unit he was responsible for medical strategy for the company and medical affairs of Pfizer’s Essential Health portfolio in North America. He previously also led the clinical development of all Pfizer compounds in Asia, Central/Eastern Europe, Latin America, and Africa-Middle East and of Pfizer’s established products globally.